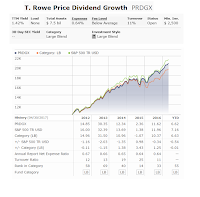 T. Rowe Price Dividend Growth Fund (PRDGX) is one of the best large blend mutual funds. This mutual fund provides dividend yield for investors. 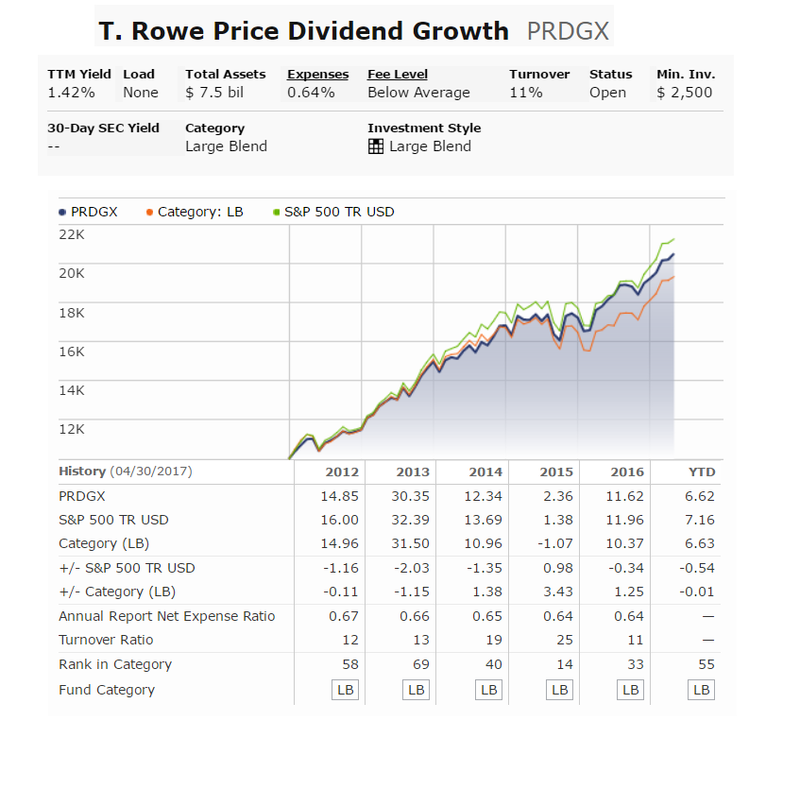 This T. Rowe Price Dividend Growth Fund objective is to provide dividend income and long-term capital growth primarily through investments in stocks. This mutual fund invests mainly in stocks, with an emphasis on stocks that have a strong track record of paying dividends or that are expected to increase their dividends over time. The fund is managed by Thomas J. Huber since 2000. It provides dividend yield of 1.42%. This T. Rowe Price Dividend Growth Fund has no sales load. There is also no 12b1 fee. The PRDGX fund has a below average expense ratio fee of 0.64%. Typical average annual expense ratio for the large-blend category is 1.01%. The current yield is 1.42%. You can start investing in this fund with as little as $2,500. Several brokerages where you can buy include Raymond James, T Rowe Price, TD Ameritrade, Scottrade NTF, Fidelity Investment, etc. Note: This T. Rowe Price Dividend Growth Fund (PRDGX) is part of Kiplinger's Best Mutual Funds, Kip 25.